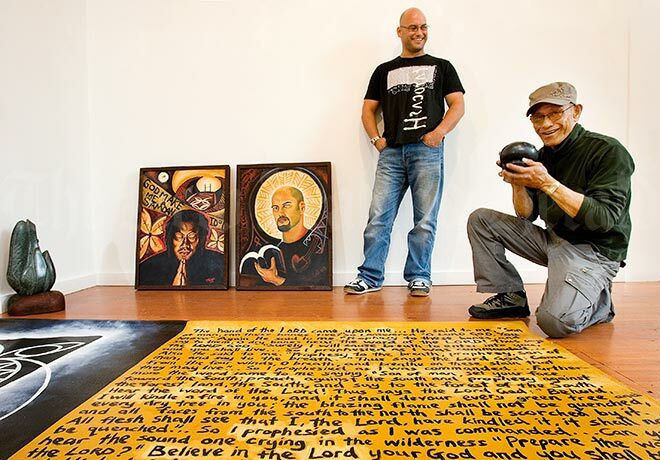 Johnny Penisula (right) and his son Lyle are shown with works for their 'Tusi folau' exhibition at the Lane Gallery, Auckland, in 2007. Johnny Penisula was born in Samoa and grew up there, settling in Southland when he came to New Zealand at the age of 21. One of the first Pacific painters to exhibit in New Zealand – his first show was held in 1972 – he is best-known as a sculptor.